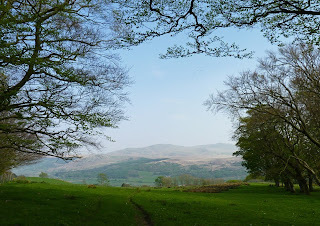 I've been away the last couple of weeks, hiking an alternative coast to coast walk across the North of England. You can read about my adventures here. There wasn't any knitting, but there were a hell of a lot of sheep. Loved this pattern - the yarn, not so much. 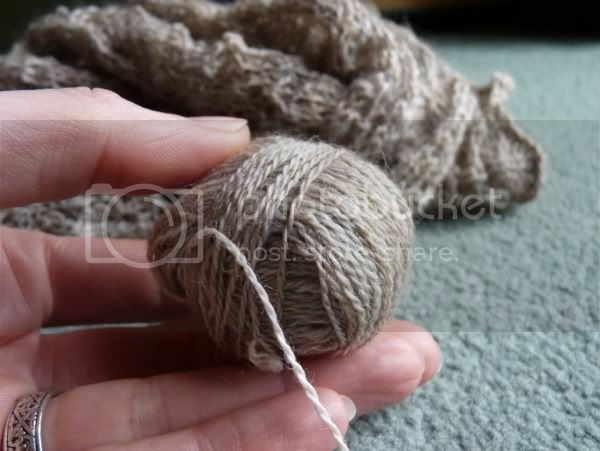 The twist was very loose so within a couple of stitches I was knitting on pretty much straight fibres which were fluffy and very easily split. Care was needed in making the stitches (which isn't too much of an issue as I can't ever really knit without looking at what I'm doing for more than a couple of stitches at a time) and especially in following the pattern, as tinking back was a nightmare. I don't know how hard wearing it will be either, so it'll be interesting to see what the socks are like after a few wears and washes. 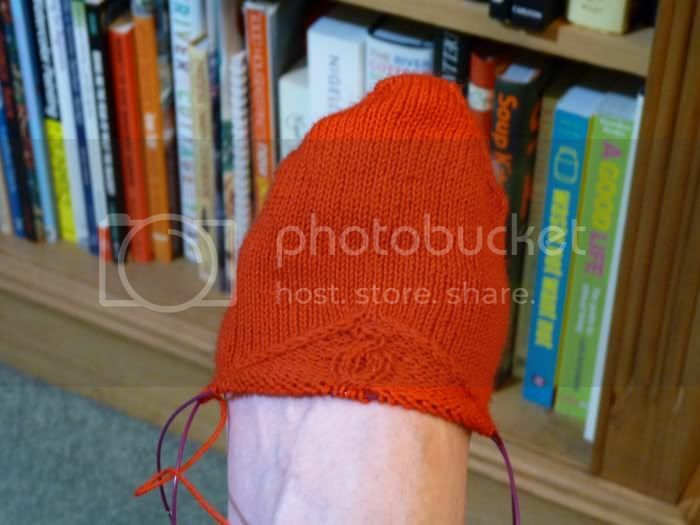 Having caught the sock bug good and proper, I cast on straight away for a pair of Absinthe socks in bright red Regia. They are done toe up, which has given them a bit of a strange pointy toe that I'm not sure if I can live with or not. I am as yet undecided but, whatever I do with them, it'll have to wait as I had a bit of an altercation with a paper towel dispenser yesterday and ended up slicing my finger open. 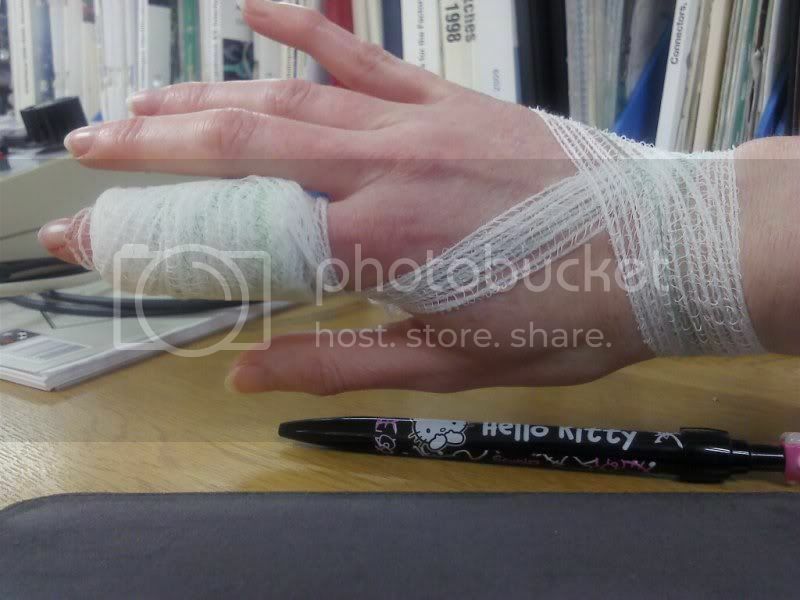 I have a slightly less dramatic bandage on today but still cannot bend my finger, so there will be no knitting for the time being - which is a bit of a shame as I'm going to be spending quite a bit of time on trains at the weekend. I should get lots of reading done, but it's not quite the same. Boo. I didn't manage to knit a lot of sock last week, as we were on holiday in Southern Poland. I did about half a dozen rounds at the airport waiting for our transfer, and about three more rounds one evening when we had a bit of time to spare between getting to the hostel and going out for dinner. So I'm still working on the sock and have nothing yet to show you - in the meantime, I have some sheep related photos from our trip. Sheep keeping warm - it was minus 14degC outside! My next project is to be a pair of Monkey socks - it seems like ages since I've made socks and it is also my knitting group's first KAL of 2011. 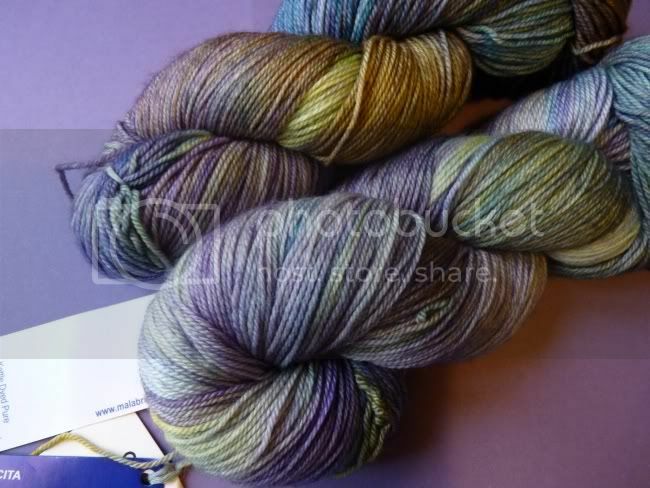 Which yarn to use can be a tough decision - solid colours can look dull on plain socks and a variagated sock yarn that is very pretty on the skein can be surprisingly tricksy to match up to a pattern. Have a look at my Bayerische socks and you'll know how I know this. So to help me decide, I had a browse of the Monkeys posted on Ravelry - and there are over 13,000 of them. I am SO late to this party that I should be carrying a bin bag and a pair of Marigolds for the morning after tidy up. As well as looking at the favourited projects to see which ones came out really nicely, I think it is equally worthwhile taking a look at the frogged pond to see what turned out, erm, less than satisfactory. For a start, there aren't nearly as many. 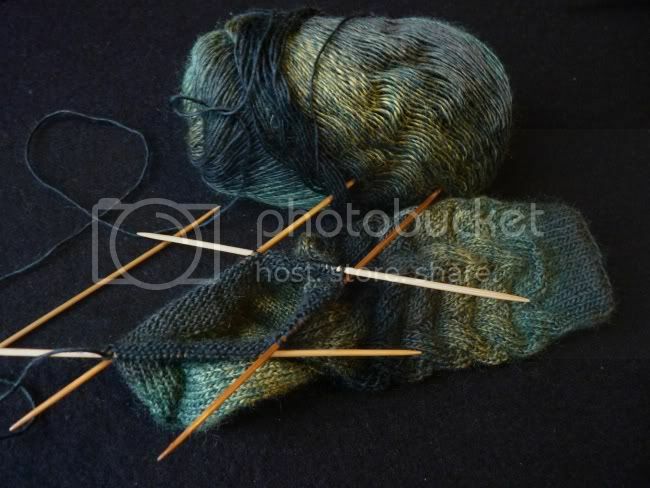 I decided that a lightly varigated yarn suits this pattern and started with some Jawoll Magic in greens. I got the Jawoll on Tuesday on a birthday trip into Manchester (birthdays are for spending time with friends and buying yarn, not being at work) and also picked up some gorgeous Malabrigo sock yarn, with which I am planning to make a Gail (Nightsongs) shawl. Pinning it out for blocking took a while, and a hell a of lot of pins - I think I need to invest in some blocking wires. This photo was taken first thing in the morning and came out very blue indeed, the second picture of the finished scarf is how the colour really is. And finished with over a month to spare before my aunt's birthday - not like me at all. 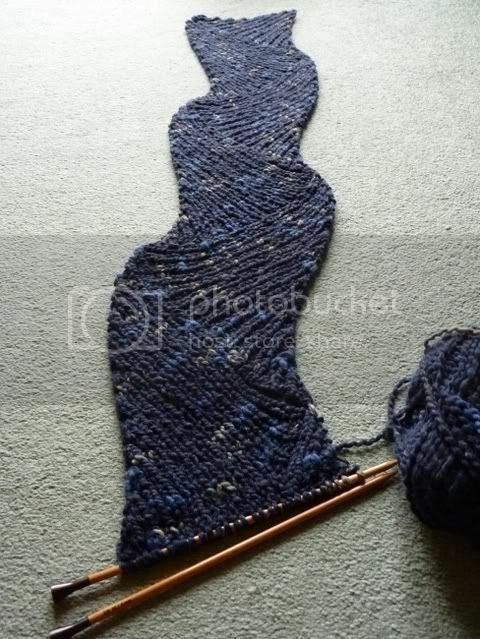 The Manos lace yarn is a joy and the is pattern fun and quick, I loved having so few stitches on the needle. Yes, there are nupps, but the Addi lace needles make them pretty easy. And very pretty they are, too. My Aunt is a very good knitter but, apart from a foray into the books of Kaffe Fassett in the 80s which introduced her to the wonders of colourwork, never really ventured outside of her knitting comfort zone. At New Year, I mentioned the world of online yarn shops, patterns and communities, and the look of horror on her face at the thought of using a computer actually surprised me. 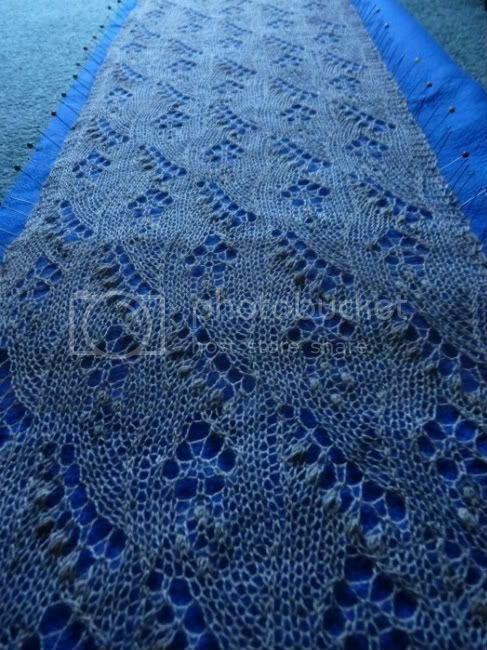 We were talking about knitting and making lace, as my Step-Mum makes lovely, very complicated looking stuff with bobbins that is very impressive and my knitted lace shawls were much admired - I had my fiery shawl with me and Diane had brought with her the Forest Canopy I'd made for her. 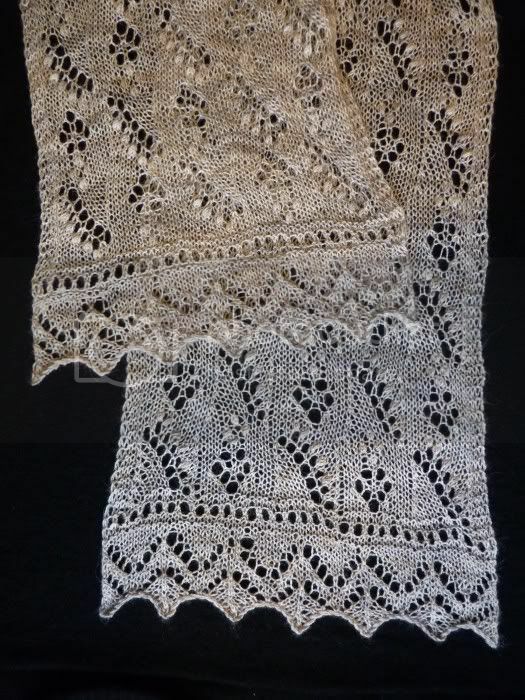 Having had my work so admired, I thought I would make my Aunt a shawl as a birthday present - her birthday is at the end of March so there would be plenty of time for even a slow-coach like myself to get it done in time. Using the Manos Lace bought just a few weeks back, I cast on for a Lily of the Valley scarf from Knitted Lace of Estonia by Nancy Bush. 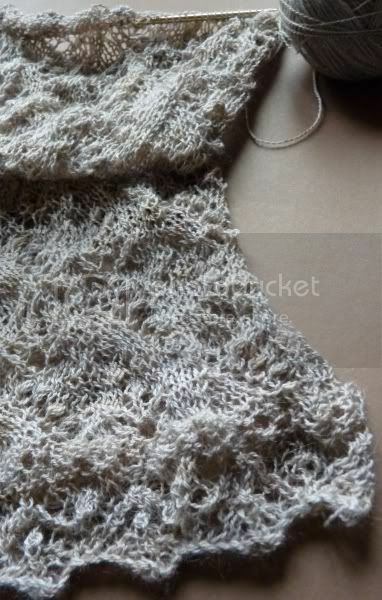 I love the delicate pattern and the fineness of the yarn, so pretty in pale grey. The pattern said 9 repeats of the lily and small flower centre chart, but the scarf still seemed quite short at that point, so I thought I would push my luck and see if I could get another repeat out of the skein of Manos Lace. My luck was in. Hurrah! It is raining, grey and depressing outside. Inside there is warmth, knitting of lace (more on this later) , coffee and chocolate orange, and making of soup. I made this for lunch today and while we were eating it decided that it was good enough to write the recipe down so I could make it again some time. Sadly, by the time I decided it was nice enough to go on the blog there wasn't enough of it left to take a decent photo of, so I've just written it down and you'll have to trust me. Heat butter and oil together and add roughly chopped onion and garlic, chopped celery and radishes. Chuck in drained and rinsed chickpeas. Chop chilli into very small pieces, add them in. When the onion is softened, stir in the tomato puree and let it cook for 5 minutes. Then add in the tin of tomatoes and water used to rinse out the can. Add in milk and powder, herbs and pepper. Cover, bring to boil and let it simmer for a while, about 10 minutes. Ladle out a bowl full of the chunky soup and whizz up the rest with a hand blender. Return the chunks and reheat if necessary. Serve with crusty bread and a swirl of creme fraiche if you are posh or with some granary sliced if you are me. There is a definite blueish tinge to this post. I love the idea of winter. 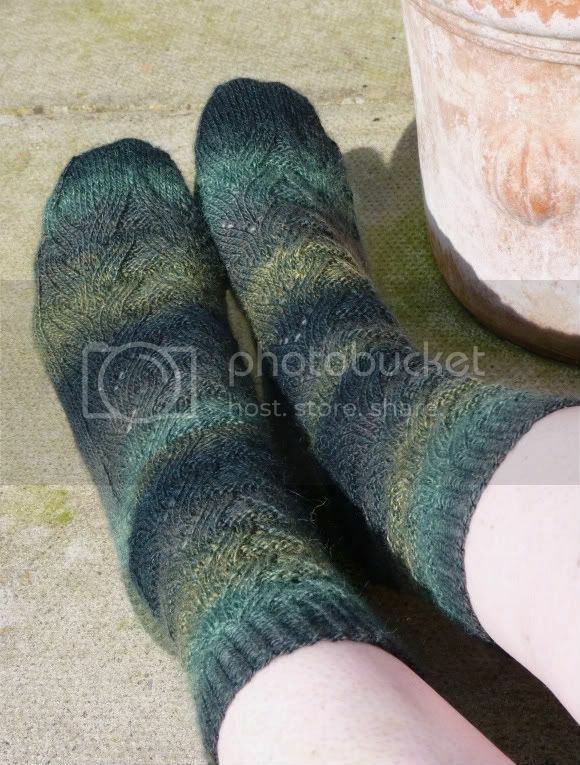 I love the thought of it being cold and snowy outside, and me sitting inside with a hot cup of tea, wearing woollens and slippers, cosy with my knitting in front of the fire. The reality is often more prosaic, especially when you have to go to work, shopping, travel but things could be much worse, the snow looks lovely and there is plenty of beauty around. And occasionally some if it can be tempted into the back garden, where I can take photos of it without needing to go out in the cold. After the stresses of the lace cardigan, I decided that I wanted to knit something that was simple and straightforward, using thick aran yarn on biggish needles. So, I picked this entrelac based snake scarf by Kim Salazar. The pattern is based on a self striping yarn like Noro Kureyon, but I love the structured look of the ribbed triangles and wanted a plainer yarn to show this off. In the stash I had some basic Wendy wool mix in navy, picked up at one of of the swaps at my knitting group, which does very well. Hi! Thanks for stopping by. 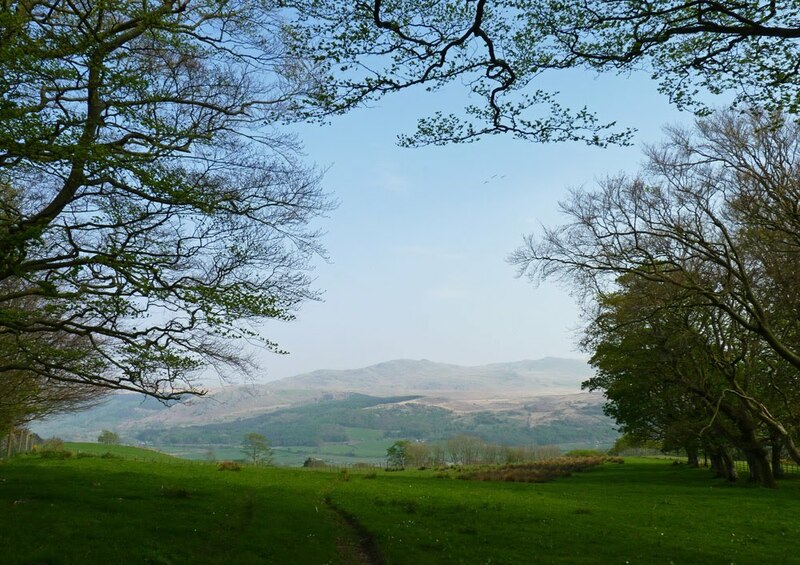 This is my blog about knitting, wool, sheep and walking.